A little competition for Nokia? 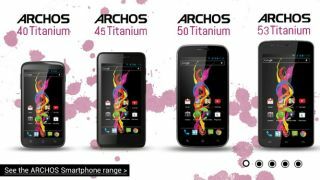 French mobile manufacturer Archos plans to throw its beret in to the Windows Phone arena. CEO Loic Poirier said the company will launch a handset on Microsoft's gradually improving platform, joining its budget offerings on Android. Nokia is currently earning a whopping 90 per cent of Windows Phone sales, with big hitters like LG, Samsung and HTC focusing all of their attentions on the Android operating system. That means a potential opportunity for manufacturers a little lower on the totem pole, like Archos, outside of the densely populated Android market. "We will launch a Windows Phone handset when the time is right," he told TrustedReviews before explaining its primary focus would remain with Android. "Before anything else we are focussed on Google," he added. Other manufacturers like Alcatel and ZTE are also planning to jump in on Windows Phone. Could we be seeing a new breed of handset makers rising on Windows Phone? Have you checked out Archos' latest range of budget Android tablets?